Valentine’s Day is tomorrow and love is in the air. But what happens when you have lost that loving feeling for your job? Yes, I said “job”. We spend more time at work than we do anywhere else, and it can be miserable when we want to “break up” with work. Just like in a personal relationship, losing the love for your job can lead to disengagement, dissatisfaction, disconnection, depression, and overall despair. Before you think about breaking up with your job, consider the fact that there are plenty of ways to rekindle the flame. It’s unrealistic to think or expect you’ll love 100% of your job, but it doesn’t need to be an all or nothing situation. Identify the parts of your job that you really enjoy, that you’re really good at, and that energize you, and find ways to do those more often. What you focus on will grow. Trying new things can be the spice of life, and the same holds true in the workplace. Seek out new opportunities, bust out of that comfort zone, and try something you’ve never done before. A new challenge is thrilling and can reignite your passion. Regardless of whether or not you’re formally recognized for your contributions, value, and accomplishments, you need to celebrate on your own. Keep that bottle of bubbly on ice at all times, and remember to congratulate yourself on a job well done. If your current position isn’t floating your boat any longer, then look around and see if there’s an opportunity in another department, with another team, or under another manager. Sometimes a change of scenery or a change in responsibilities can bring back the love. Never underestimate the power of a positive attitude and mindset. Whether it’s through daily affirmations and mantras, meditation, or inspirational quotes, surrounding yourself with an abundance of positive energy helps to drown out the negative noise. Isolation leads to loneliness and lethargy. 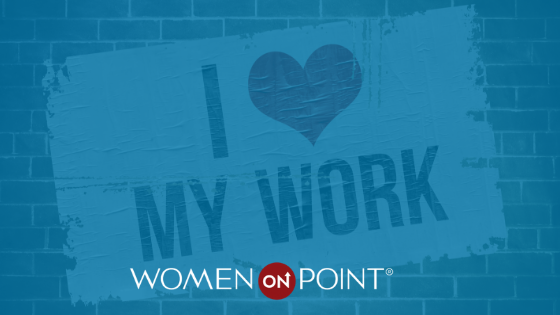 Get motivated by getting involved…join a club, a group, activity at work or Women ON Point. Step away from your desk and invite a co-worker to lunch. Accept an invitation to happy hour and start having some fun. Seeking the guidance and advice of a more seasoned or experienced professional can provide some much needed perspective to get back on track and fall back in love with your job. There is a lot of love at Women ON Point, and we LOVE to shine a big, bright light on our alumni. Check out this month’s Success Spotlight and please help us congratulate these amazing women!! Brittany works at the University of Minnesota in the College of Education and Human Development and was recently promoted from Associate Development Officer to Development Officer!! Brittany accepted a new role as Office Manager with United Forest Products!! Based on what Laslie experienced at the summit, she decided to pay it forward by giving her entire team the DiSC assessment and training.